The white classic undershirt. What started as standard-issue Navy wear has morphed into men’s wardrobe staple. But thousands of options exist today — and not all are created equal. How do you find the best men’s undershirt? Undershirts provide an extra layer of warmth, block sweat and protect your clothes. A quality undershirt makes a huge difference. When spending serious dough on dress shirts and suits, you want them to endure bouts of stress sweat without yellowing or ruining them. After all, your undershirt sits against your skin (and gets soaked in sweat), so it should feel soft and withstand moisture. But not all men's undershirts hold up to the test. There are a lot of cheap knockoffs out there that won’t protect your clothes against heavy sweating. So how do you tell the best men's undershirt from a dud? 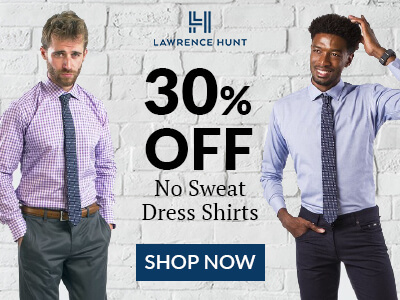 Like dress shirts, great undershirts contain quality materials, fit well without shrinking, retain their shape, have ample length for tucking and don’t restrict your movement. They also blend in seamlessly with your wardrobe and suit your style. Beyond looking and feeling nice, the best men’s undershirts last longer than cheaply made ones. When it comes to high-quality undershirts, natural fibers like cotton and rayon from bamboo are superior to synthetics materials like polyester and nylon. But that doesn’t mean every cotton tee is a good choice. The quality of the cotton depends on the length of the fibers. Long-fiber cotton blends include Pima, Supima and Egyptian cotton, combed cotton, jersey, modal and rayon. Breathe better. Longer fibers can be spun into finer yarn and more tightly bound. As a result, you eliminate potential air pockets between threads (which retain heat), helping you feel cooler throughout the day. Hold up longer. Tighter bonds also result in a stronger, more durable shirt. Feel softer. Long cotton fibers create softer yarn than shorter fibers. The fibers can be spun into yarn with fewer stray ends sticking out, eliminating the itchy, scratchy feeling you've probably experienced from poorly made cotton shirts. Synthetic fibers don’t have an entirely bad rap. Blending a small percentage of synthetic fiber with natural ones improves fit, adds stretch and elasticity and ensures the shirt retains its shape after washing. It’s easy to get duped by clothing brands, especially when shopping online. Manufacturers have tricks to make garments look nice in person, but start to unravel after a single use. You know the type of cotton matters in your undershirt. But beyond that, how can you fairly judge a quality undershirt from a cheaply made one? Here are six tips to help you separate the heroes from the zeroes. Your undershirt should feel soft on the skin — even if the cotton is thick or stiff. Softness often means the shirt consists of long fibers and will likely hold up. Pilling happens when yarn fibers break or loosen, or when exposed ends tangle, leaving small fluffy balls on the surface. Signs of pilling usually aren’t apparent until after a few wears, so if you see any pills at first glance, it’s best to forego the shirt altogether. Although most fabrics are prone to pilling, high-quality undershirts won't pill as quickly. Gauge the thickness of the fabric by holding up your shirt to a light. If lots of light shines through, the shirt likely won’t last too long. Cotton undershirts spun from long, thin fibers won’t separate when gently pulling on the seams — they have a consistent pattern and stitching. If you spot gaps between stitches or size differences between threads, the shirt is probably a poor investment. Quality cotton shirts should bounce right back to their natural state after scrunching them in your hand. If your shirt stays wrinkled, it’s a telltale sign it’s not high-quality cotton. Loose threads or uneven seams signal the shirt was made from shorter fibers and probably won’t stand the test of time. After you test the quality of an undershirt, you need to identify the proper fit. Traditional undershirts should be close-fitting to the body, with smaller armholes so they comfortably fit under clothes and aren’t visible. If you wear more form-fitting clothes, a slim-fit undershirt is a good alternative. See our guide on how to find the best undershirts for sweathere. Constantly tugging and tucking in your undershirt is no way to live life. Before you purchase one, ask yourself if you want an undershirt that gives you full coverage or one that stays completely invisible? If you find yourself sticking to outer shirts with high necklines in fear of your undershirt peeking out, we recommend trying a V-neck or even deep V neckline. With these styles, no shirt is off-limits. Go ahead Rico Suave, unbutton your shirts one, two, three or more buttons! You should also consider the length of your undershirt. If you sport mostly casual, untucked shirts, buy shorter undershirts. T-shirts that hit you at or an inch above the hips will stay perfectly hidden. If you always tuck in your outer shirts, get longer undershirts that fall at or slightly below the top of your pants inseam. The added length will help keep it in place even when you raise your arms. Instead of throwing on a white undershirt every day, choose one that blends in with your outer shirt. Don’t wear a white undershirt underneath a white dress shirt. Because dress shirts are sheerer than t-shirts, white under garments show through. Instead of wearing a stark white undershirt underneath, try a neutral or off-white color. A good rule of thumb is if your outer garment is a dark color like black, navy blue, maroon, army green or charcoal grey, don a black undershirt. If you’re wearing a lighter pastel color, stick with a white or grey one. Thompson Tee’s sweat proof undershirts are made from 100% premium combed cotton and rayon from bamboo, so they're breathable, comfortable and durable enough to last a year with heavy use. Armed with patented underarm sweat shields, the shirt completely blocks moisture from seeping through your clothes and ruining expensive dress shirts. With more than 45,000 ecstatic customers worldwide, Thompson Tees truly are the best men's undershirt — whether you sweat heavily or not. Try one risk-free today.